Has another week already passed again? Seriously? I go back to work in three weeks...I feel like I just packed my room up. Anyways...It is time to get acquainted again. I'm on a roll!!! I was determined to get this post up. Tell about your favorite teacher and explain why. Share a memory or two. There are many reasons of why I became a teacher. Among those reasons is the awesome teachers that I had growing up. I want to be a big influence on my students lives. I hope when they are grown and when they reflect on their great teachers, that they think of me. So....I wanted to share about my favorite teacher growing up. Her name was Mrs. Lisa Trobaugh and this is a picture of her. She was my fifth grade teacher in 1995. Wow! That was soooo long ago!!! She was definitely my favorite teacher. I was in her first class because she was a brand new teacher. I just remember that she had so many ideas and new types of things for us to do. We did not just do worksheets like some of my other teachers did. Her class was very interactive!!! She was a friend to her students and she was fair. My favorite memory would have to be when we learned how to do How-To writing. It was so much fun. The topic was...How to make an Ice Cream Sundae. Everyone had to write the directions of how to tell someone how to make an ice cream sundae. We took about a week writing our papers. She warned us to think of everything that would need to be included. We were surprised at the end of the week with real ice cream and all of the toppings. We had to read our paper one by one as she fixed our sundae exactly how we said. It was so funny because if you did not say first get a bowl the ice cream just fell on the floor. Eventually everybody ate their sundae and we had a great time. She was a fabulous teacher. The picture below is from our rewards day at the end of the year. I'm the one in the pigtails and blue and white dress. Mrs. Trobaugh is in the back with the black shirt. Ok now it is your turn...Go link up and share about your favorite teacher and memory!!! Remember you can link up all week and when you do please comment and visit 2 people in the linky before you. Your teacher looks too young to have taught you, although she looks like a little girl herself in the school picture...lol!! That is amazing! You looked so cute with your pony tails! I love your "Let's Get Acquainted" linky...keep it coming!!! I love that you still have photos with your teacher in them. :) Great Linky Idea. This is a wonderful linky idea. It is so fun to read. WOW...only 3 more weeks before you go back to school? We don't start until after Labor Day. I always wish we start a bit earlier to get out earlier, but I'm not sure I would want to start that early. When do you get out? Thanks again for hosting this fun linky! It's been nice "meeting" all the bloggers as I'm a newbie this summer! Thanks for the linky! I hope to learn a lot through my experiences as a blogger. 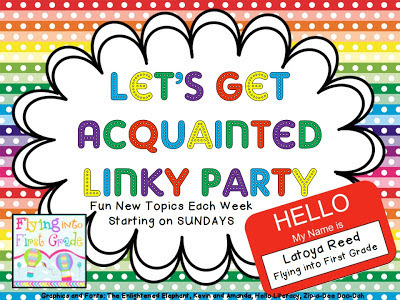 Stumbled upon your linky party and blog and am happy to be a new follower. Such a good information. It is purely safe to our kids,and bring them enjoyment and excitement. Thanks For sharing with us. Please visit here for more information as Jumping Castle Hire Sydney.And keep share more blogs for us.